Hey y’all. 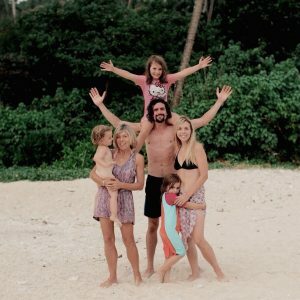 I recently did a blog post about what our day to day lives look like as a full time travelling family– what we do, our (vague) routine, how we do laundry etc. One of the things that someone asked after reading the post is, how/what do we feed the kids? 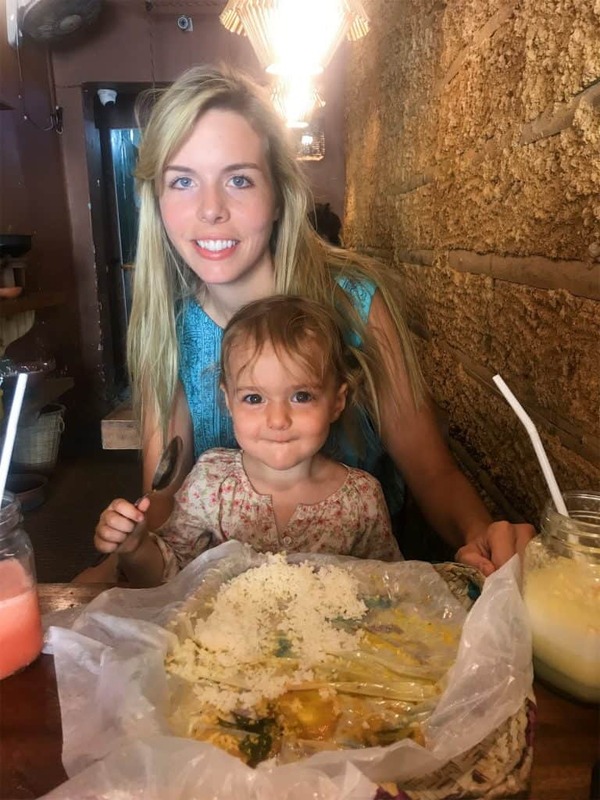 Several people on Facebook groups and in forums have brought up the fact that they think that finding healthy food for kids during round the world travel, or even short-term travel, would be really hard. 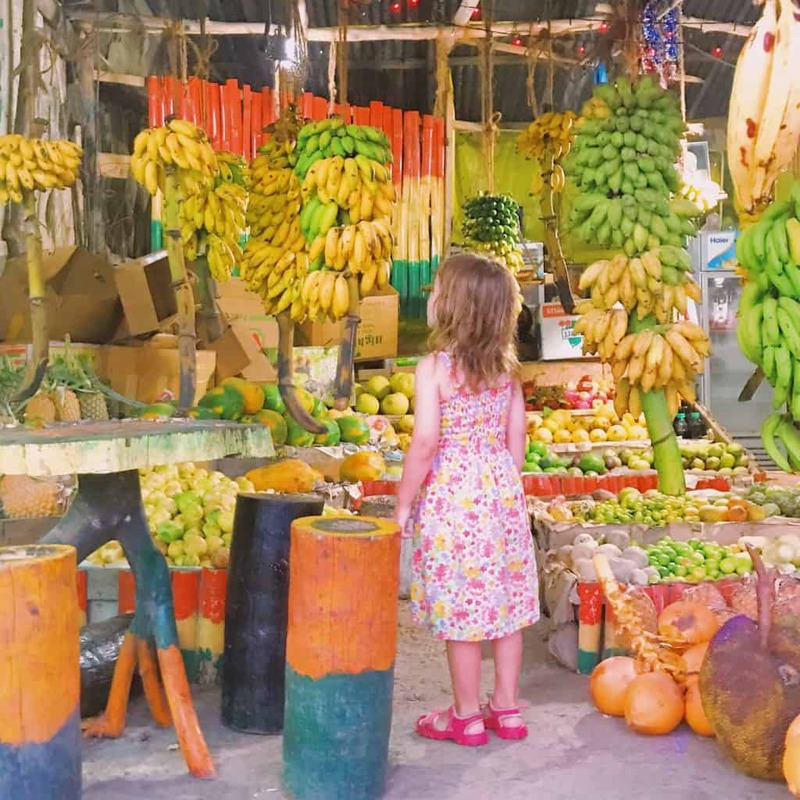 I thought I’d share with you what our experience has been and what we do to try and find tasty and healthy food for kids as we travel, as well as some tips for your own trips! Before the arrival of the girls, us adults (Patrick, Mum and myself) had all backpacked around Asia and beyond, and were used to eating new food and going ‘off the beaten track’. We’ve tried stewed nettles in Thailand, mealy meal in South Africa and even at one point in pre-vegan days, crispy scorpion (I tried to swallow it whole and puked, if you were wondering). Travelling with kids is, of course, different than winging it solo- we need accommodation that protects us from the elements (pre-kids Patrick and I slept in an Early Learning Centre tent on a beach on a Malaysian island), and that is near decent food sources. The kids can’t handle as much spice as us and are less adventurous when it comes to trying new things (a different brand of ketchup? Good luck my friends) so we stay in relatively built up places where we can get hold of food that they will eat. 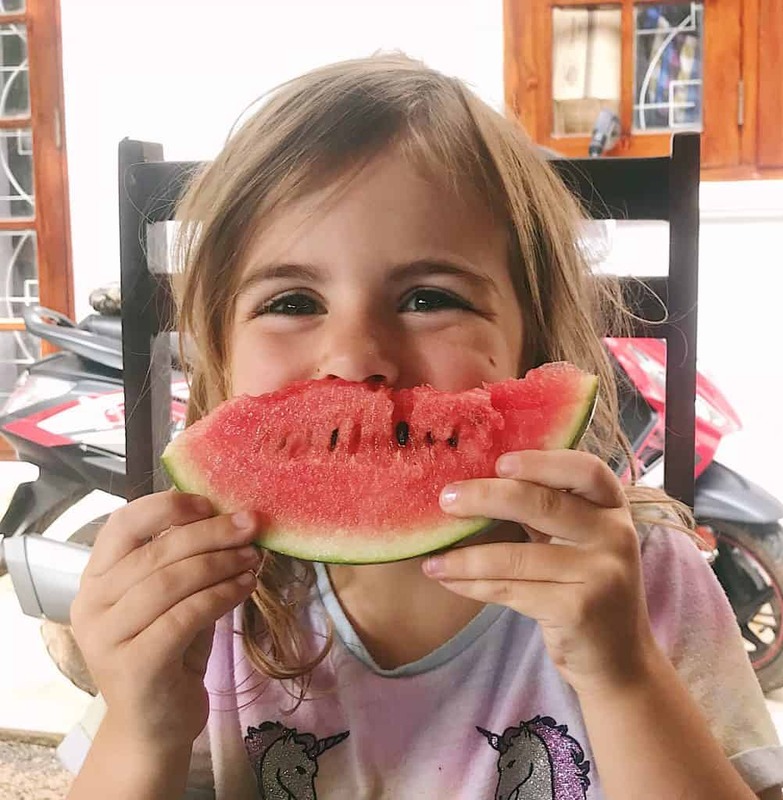 Watermelon smiles- always a winner! Our general food routine for the kids is to have brunch at our apartment/room in the morning, and this is pretty standard western stuff- cereal (cornflakes), toast or sandwiches, eggs, baked beans when we can get them, pasta and fruit. We don’t care if it’s ‘breakfast’ food or not- if they’ll eat it, great. We pick up food sometimes from convenience stores (there are plenty) but mainly supermarkets and market stalls. In the evening they order a variation of: pasta with fresh tomato sauce, or pizza, or chips, or sandwiches with salad, or soup. I try and encourage them to agree on 3 different dishes and then have a bit of each, because a) to mix up the nutrition and b) as soon as they see what the other one’s got they’re likely to want it too, so if we agree to go tapas-style everyone is happy and gets to try lots of different menu items. Recently Eira has been into samosas, and her spice tolerance is going up a lot. We always have fresh fruit available 24/7 at home and they gorge on oranges, lychees, bananas, pineapple and mango (there is seriously amazing fruit in Asia!) We also have biscuits and crackers available and occasionally crisps, and if they ask for something more substantial like pasta I don’t worry about what the clock says, I just cook it, it takes 8 minutes. In Sri Lanka and Thailand we have found it more difficult to find fresh raw veg like they were used to having in the UK- I would often make a ‘monkey platter’ with lots of different foods and include cucumber, sweetcorn, pepper and carrot sticks. We haven’t been near fresh markets with those things in here and so we are missing that and hoping to find shops with them in the next town we visit. Elfie is still breastfed (on top of food) so I’m happy that I know she is getting plenty of vitamins, minerals and fats from that. I would definitely advise traveling families to bring Tupperware with them (see my post with snack kit equipment here), so that you can make your own snacks to bring out for the day, and have cut-up fresh fruit to hand for snacks at home. It saves money and it means that you’re not caught short and having to buy processed snack food wherever you are. Us adults usually have more traditional food wherever we are- we love Asian food and it’s always cheaper than western food. At the moment have roti and curry for brunch and then more vegetable curry for dinner, with sandwiches made at the apartment or fruit or crackers and peanut butter for snacks. Although the exact dishes change from country to country (in Bali it was nasi campur, in Thailand stir fry veg with rice) it’s pretty much the same kind of thing. It’s easy and very cheap to get take-away in Asia, they just wrap roti in newspaper and we have now bought Tupperware so that we don’t need to have plastic cartons for our takeout food. We’re also hopefully buying a blender in the next city we visit so we can do smoothies at home (home being wherever we staying! ), which will be fabulous. So that’s how we try to sort out healthy food for kids while traveling! Of course it’s a challenge getting the same food as at home, but that’s part of the experience of travel- it’s not the same, and kids will find things they like that they might not have tried back home. 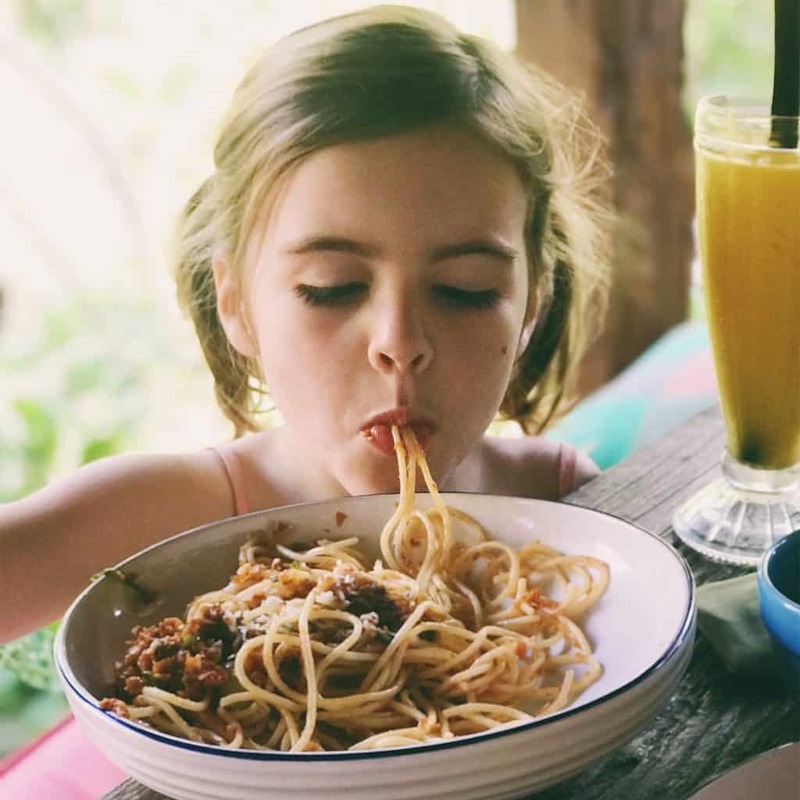 Here are our tips for feeding toddlers and kids while travelling abroad. 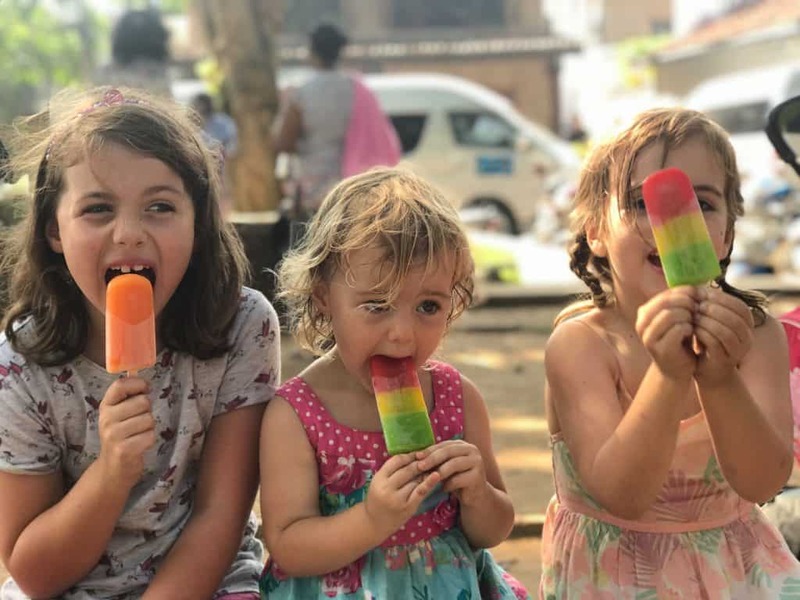 Top tips for healthy food for toddlers and kids while travelling (from a full time travelling family! Bring familiar snacks for the journey, plus some extra for the first few days. Transition, even fun ones, are hard for kids and having familiar foods will help make that change a bit easier. It also means you won’t need to rush to the nearest store to stock up on food when you get to your destination if you have some familiar (non-perishable) favourites in the case. I would recommend bringing oat bars, date-and-nut bars, fruit pouches, other compressed fruit snacks and even a box of cereal for them to much on. Fruit works really well for the journey; try to avoid highly processed sweets as these just make everyone feel sick and lethargic. Let your child pick some of their snacks so they feel included in the preparation for the trip! 2. Bring familiar feeding utensils- if your little one has a a favourite (non breakable) plate and cutlery, bring it. We brought kids’ chopsticks with us travelling and although the girls haven’t used them loads, they are a lot of fun. We’ve also got melamine plates and a knife, fork and spoon in our case so that we can prepare a quick snack of nut butter sandwiches and fruit in our apartment or hotel room. 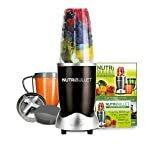 In hindsight I’d also pack a peeler for raw veggies, and a Nutribullet as the cost of smoothies is much higher than the cost of fruit, and often smoothies from cafes have added sugar. 3. If you have a fussy eater, don’t go too far off the beaten track. Travel is busy and stimulating enough for kids without having to deal with being hungry too. Coastal towns are usually used to tourists and will have some familiar food available. Don’t worry about not have an ‘authentic travel experience’- from the more touristy places you can always get day or weekend trips further out, and with kids that will be plenty long enough away from civilisation anyway! 5. Don’t sweat it. Stress is far more harmful to people than a few weeks days without broccoli. Offer a range of foods and model good eating behaviour (if you try new foods your kids are more likely to), don’t push the issue and try and relax. There’s no point in forcing kids to eat ‘healthy’ food if you’re stressing them out and ruining their travel experience. We find that we are so much more active now that we are travelling full time and I think this is often the case, so accept that it’s a process and focus on enjoying healthy food yourself. 6. Get some basic snacks to have in your hotel room such as a loaf of bread and jar of peanut butter and jam, as well as tupperware boxes of fruit if you have a fridge (most apartments and hotel rooms do have a fridge, or a shared one in a guest house). Hangry kids are no fun and if breakfast isn’t included in your room price, having some bits in the room means you won’t have to rush out at silly o’clock in the morning to find a cafe. 7. Research food hygiene before you go somewhere; for example salad in Asia is often washed in tap water which is one of the main ways people get sick. You’re also more likely to get sick from eating pizza than stir-fries, because they are often left luke-warm and then reheated. Street food is great if it’s fried in front of you as it kills the germs, but avoid anything left in glass cabinets. Then there are location-specific things such as the cups washed in puddles in India, and watermelons in Turkey that are soaked in dirty river water to make them bigger- ask the hotel or guest house owners if there is anything you should be aware of. And my biggest tip of all: Know and remind yourself that what goes into your child’s mouth DOES NOT dictate your value as a parent. Healthy food for kids is food that nourishes their wellbeing as a whole, not just their short-term nutrition. Get daheck off Instagram and know that So. Many. Parents are despairing as their child eats yet another day of beige food. Prioritise your connection and creating a happy time for yourselves as a family as you travel, and take the pressure off yourselves and your kids. Kids won’t remember a trip for how many bits of broccoli they ate; they’ll remember how much fun they had and how much time you spent relaxing and playing with them. Peace, dudes! I hope that’s helpful- if you have any specific questions about getting healthy food for toddlers and kids while you travel please drop us a comment and we’ll be happy to help! Lauren, looking over my shoulder: Mummy, can we get some watermelon? Me: Winter, blah, blah, but it’ll probably be the very first thing we eat when we go on our big adventure holiday! Definitely coming around to the idea! And also, yeah! YEAH!! Beige food for a week or three, cheerios and whatever from home, fresh fruit of their own choosing, and me being grateful for food for me that I enjoy- not food for them that I think they should enjoy because I would, or should eat without enjoying, or whatever.